rays, noise and even intruders everyday of the year. Link here for PGT 2013 Rebate Flyer. Link here for full information from PGT on rebate. PGT WinGuard windows and doors provide a tough and resilient laminated glass that protects your house against nature and also protects it against man-made threats, meaning intruders seeking entrance into your home. WinGuard windows and doors block out 30% more noise than regular windows and doors. They block out 99% of UV rays that can fade your furniture, carpets and draperies. 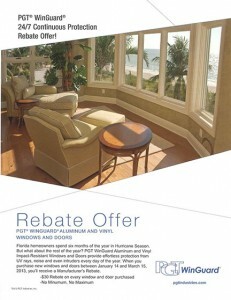 Receive a manufacturer’s rebate of $30 on every window and door purchased between January 14 and March 15, 2013. NOTE: Quotes must be converted to orders within the specific offer dates, no exceptions. Let Lemon Bay Glass + Mirror guide you through the order process. Take the guess work out of your project.